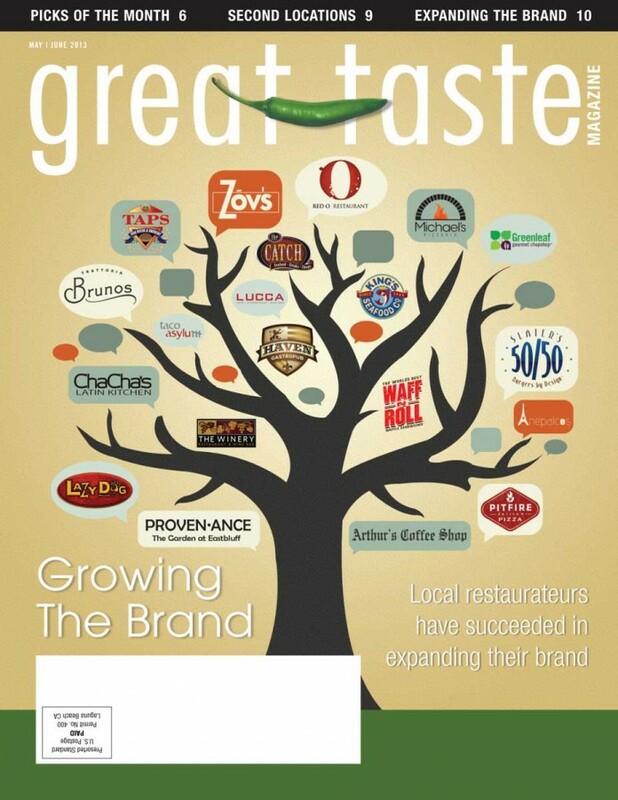 Great Taste Magazine 2013 May June Issue departs from our usual run down of chefs, recipes, and front and back of the house articles to focus on some original Orange County restaurant groups. The restaurateurs behind these successful operations share a range of experiences both good and bad. Although it may look easy from the outside, the challenges never stop. Each restaurateur has learned lessons along the way; some of which they shared with us. Restaurateurs in this issue juggle multiple establishments with different concepts. Places like Bruno’s and Cha Cha’s; Anepalco’s Cafe and El Mercado; LUCCA and soon-to-open Provenance; Arthur’s Coffee Shop and Waff N Roll food truck; and King’s Fish House and Pier Burger (operated by King’s Seafood Company) show us how operating differing ventures can be twice the work and offer twice the pay off. Other companies have duplicated their success in different locations by creating new concepts. At Haven Gastropub, the Haven Collective trio serves their take on upscale pub food in Orange and Pasadena, while taco asylum crafts globally inspired tacos. Haven Collective’s new venture, Provisions Market, sells artisan beer, doughnuts, to-go foods, and wine. Michael’s on Naples opened first in Long Beach and has since added three Michael’s Pizzeria’s: Naples Island, downtown Long Beach, and Rancho Mirage. Dual TAPS Fish House & Brewery plus The Catch eateries welcome diners in Brea, Corona and Anaheim respectively. The signature restaurant Zov’s in Tustin, owned by Chef Zov Karamardian, was followed by bars, bakeries and cafes in Newport Beach, Irvine and two in the John Wayne Airport. Places like Slater’s 50/50, Bruxie Gourmet Waffle Sandwiches, and Lazy Dog Restaurant & Bar all have multiple locations with identical menus. Why mess with success? Slater’s is at six locations and counting while Lazy Dog has eleven with number 12 on the way. Bruxie has five with number six coming soon. Eat Chow Now serves eclectic American food to a steady flow of customers in Costa Mesa and Newport Beach. Surfas Restaurant Supply and Gourmet Food opened their second location in Costa Mesa’s SOCO after opening the Los Angeles store in 1937. Red O anticipates a warm welcome at the unveiling of their Newport Beach location which will feature a menu crafted by Rick Bayless. Care and attention to detail characterize each dining oasis. The owners describe how listening to guests, adapting menus, and keeping a rein on finances all play a role in their work. Their words will inspire and surprise you.